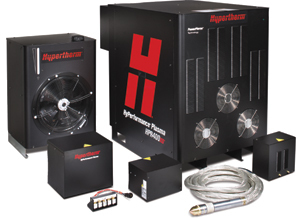 system, which reportedly can pierce material that is 60 percent thicker than its predecessor, the HPR260, could pierce. Speed also has been increased, due to a patented consumable design, as the new system cuts 30 percent faster than the 260, reportedly offering precise cuts for longer periods of time at half the normal operating cost. The ‘XD’ designation indicates argon capabilities that deliver improved marking, improved ability in cutting thin stainless steel, and an increased power supply and current accuracy, according to company officials.